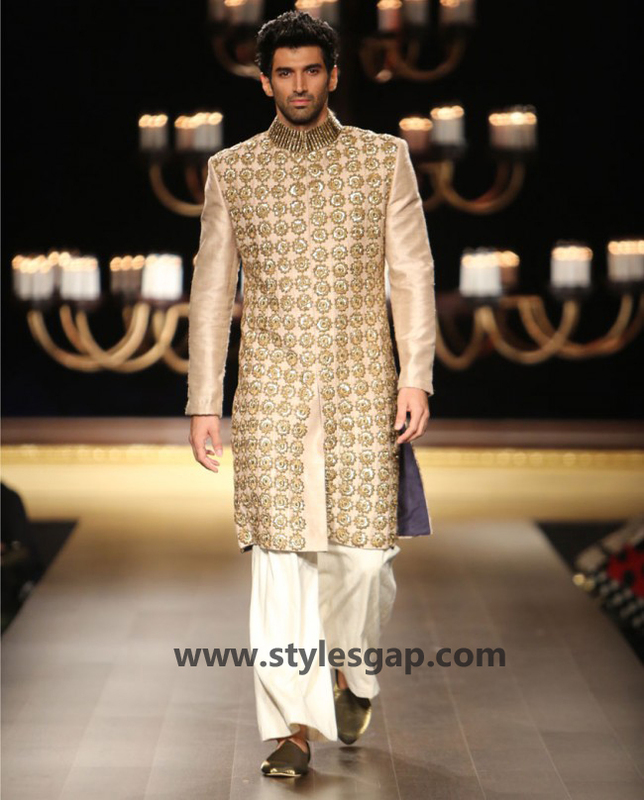 As the wedding season has reached near to the climax. 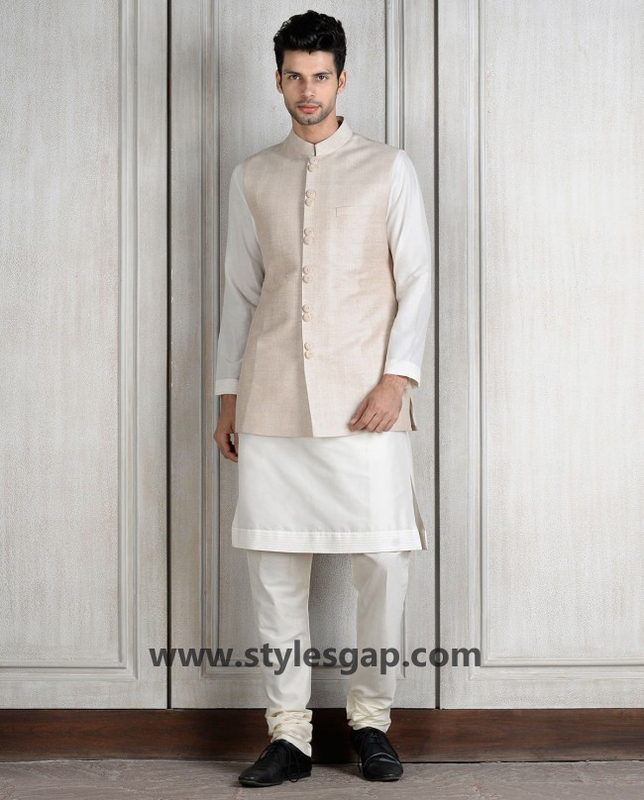 Most of the brides to be, seem to be much considerate about their wedding & formal wardrobe. 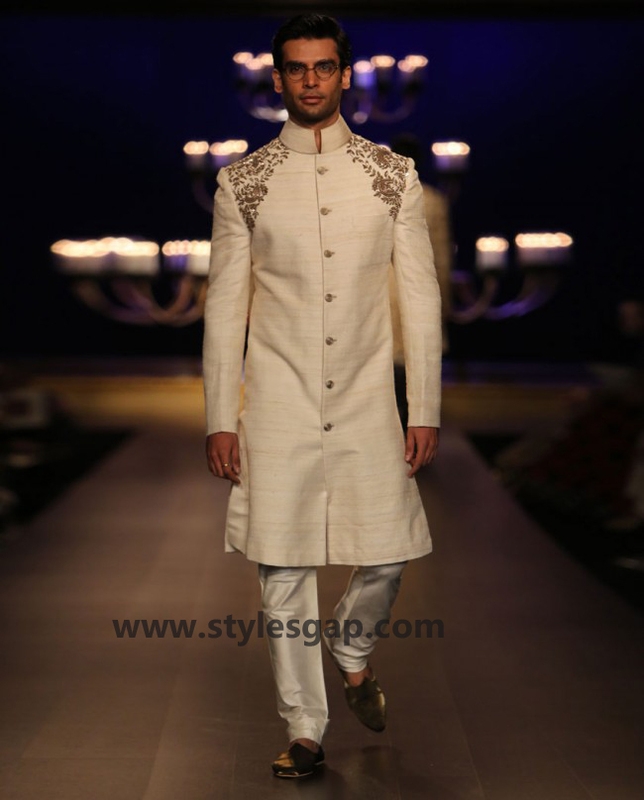 Same is the case with the men about to be tied in the bond of marriage. 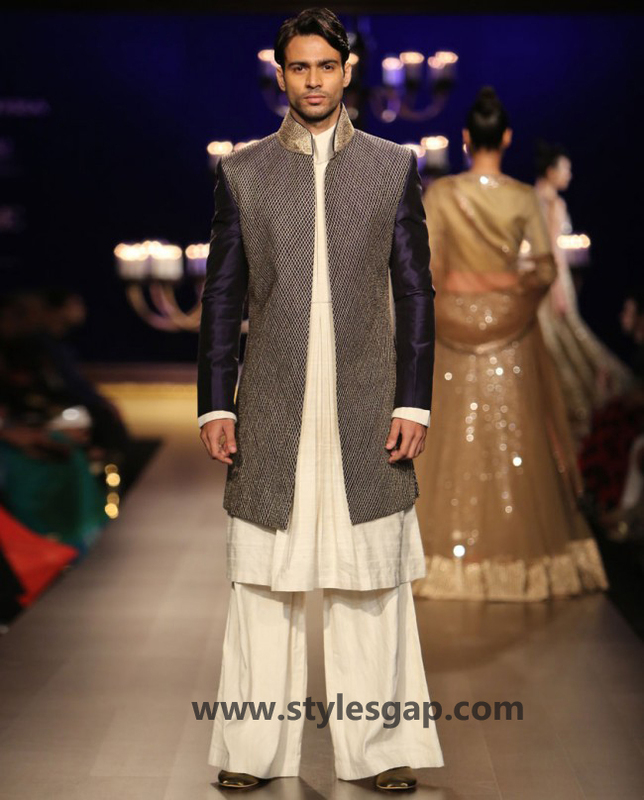 They all need style packaged with the trend for their precious day. 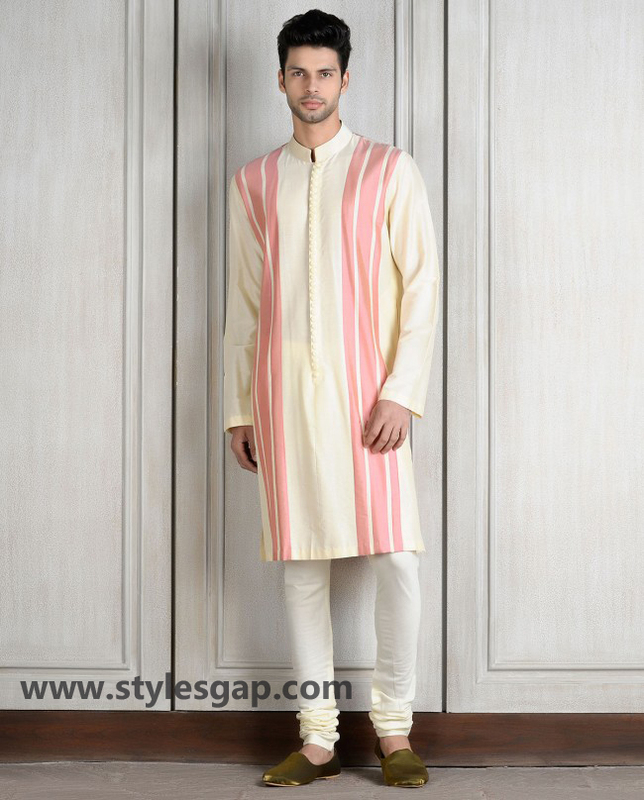 All seek to buy the most renowned fashion label to try for their wedding. 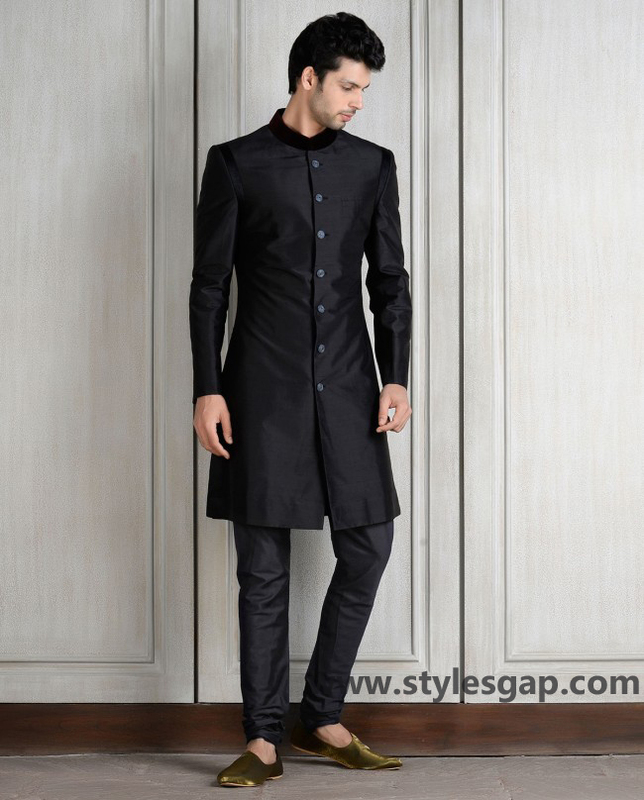 Despite the fact that there are many popular existing trends of Sherwani and suits prevailing in the fashion circles, but people like to opt only for the designer brands. 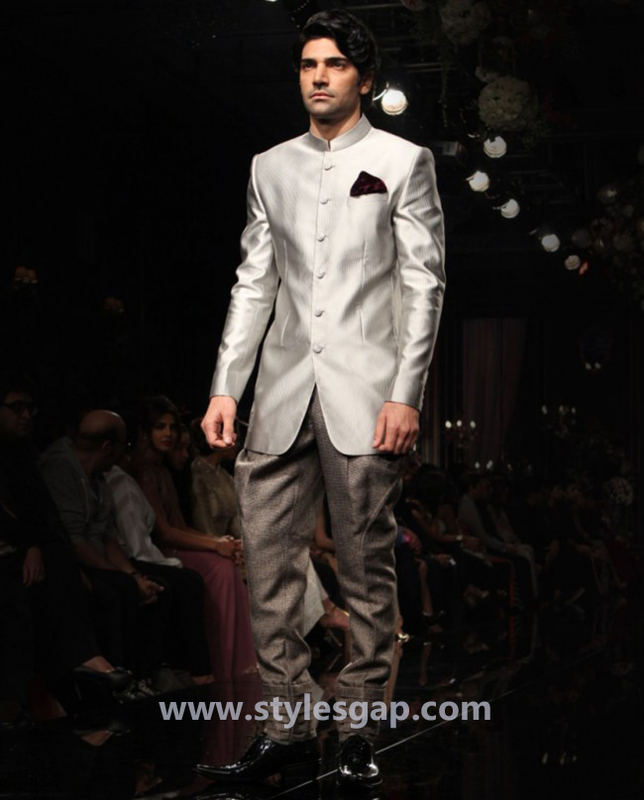 Here we are sharing the Latest Men Wedding Sherwanis Party Suits. 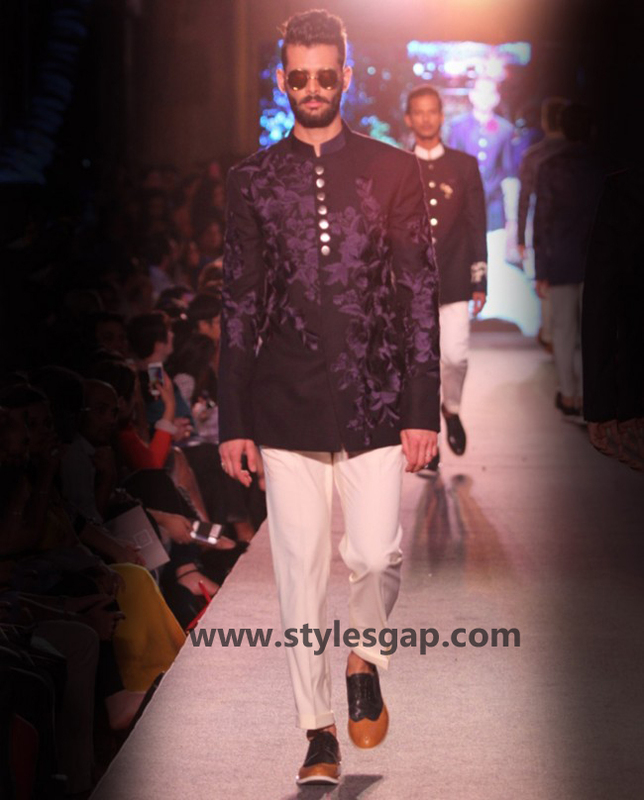 Among all the great men’s clothing line especially in context to wedding sherwanis and suits, Manish Malhotra has made his name not only in India but the entire subcontinent. 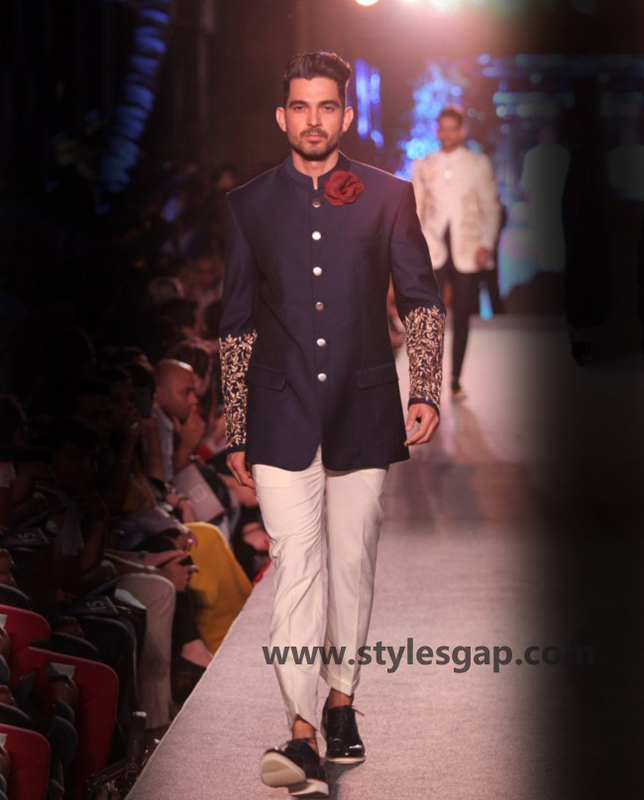 His inspiring designs serve as the foundation for others to carry a specific trend and style. 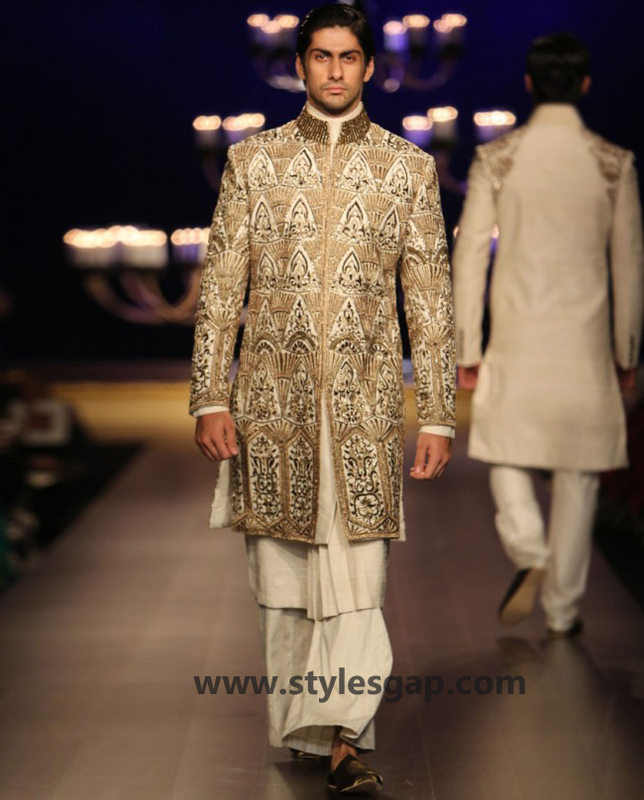 So if you have wedding nearby or needs a trendy Sherwani outfit for your closed one’s wedding then the Latest Men Wedding Sherwanis Party Suits Collection by Manish Malhotra is going to provide you all more than you can imagine. 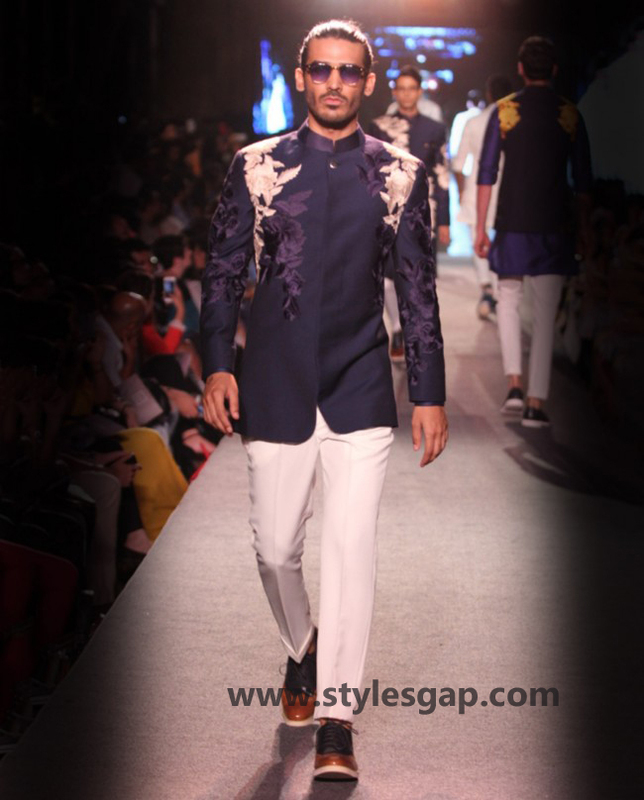 Today’s article is meant to unveil the complete insight regarding the latest fashion buzz regarding the men wedding sherwanis & party suits launched under the label of Manish Malhotra. 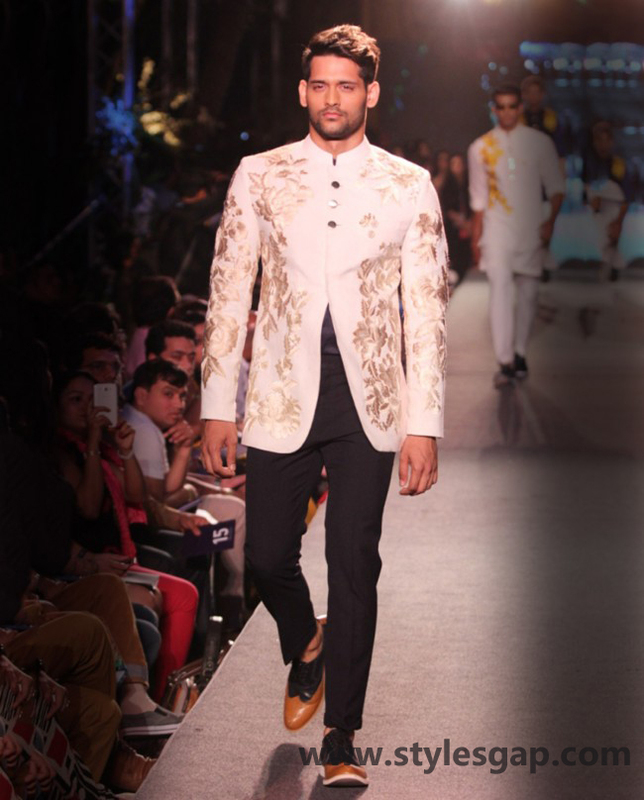 Elegance, decency and style form a new combo when they are interwoven into the fascinating designs by Manish. 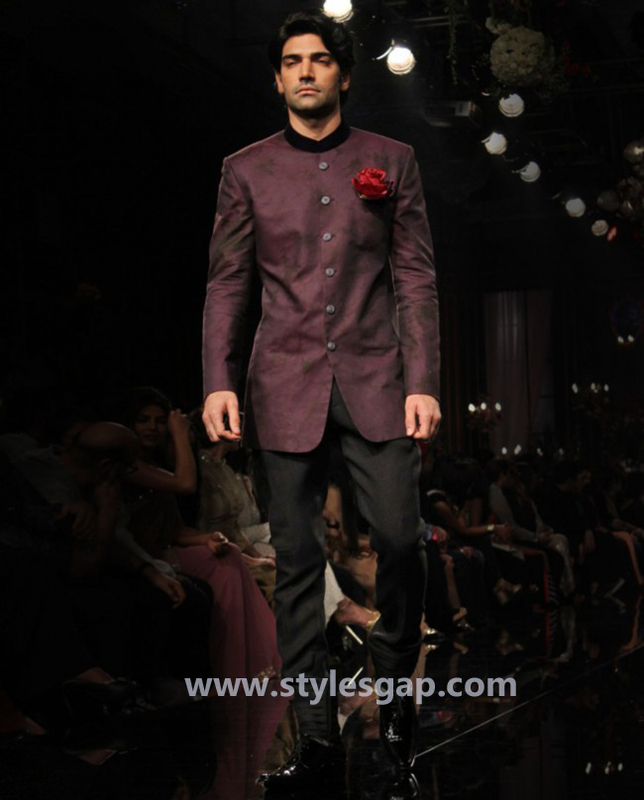 He has his unique set of taste and ideas that could turn any fabric into a masterpiece. 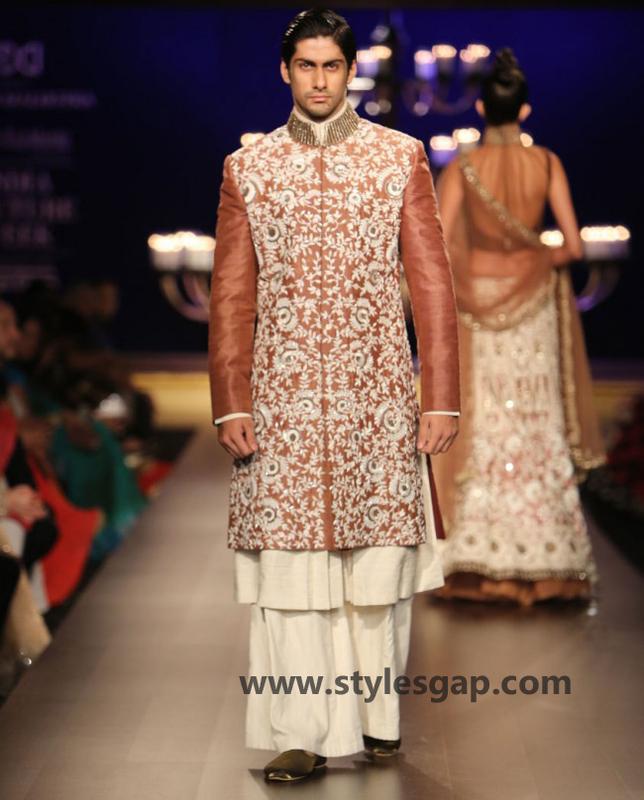 It is the reason that the latest collection of wedding sherwanis & party suits also seem to be depicting the same. 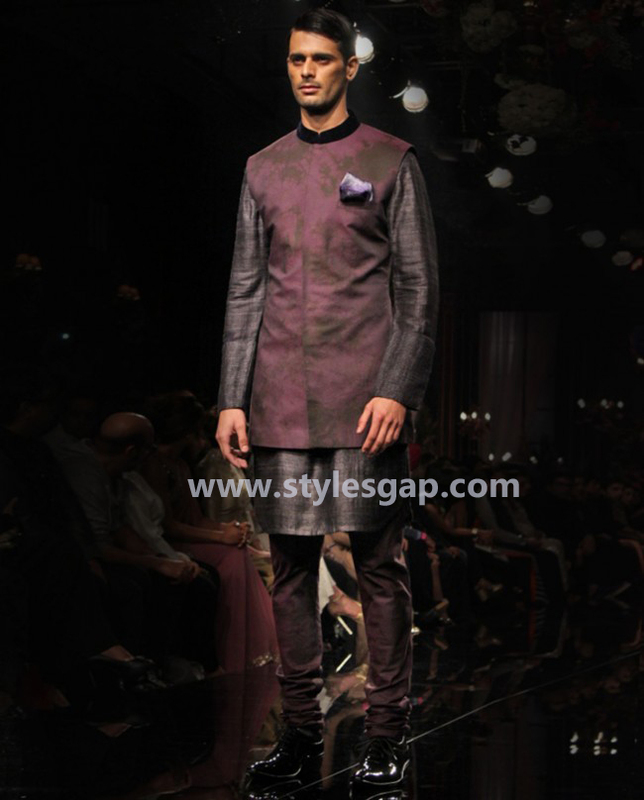 The fine embellishments around the neck collar add a glitz and glitter to the Sherwani. 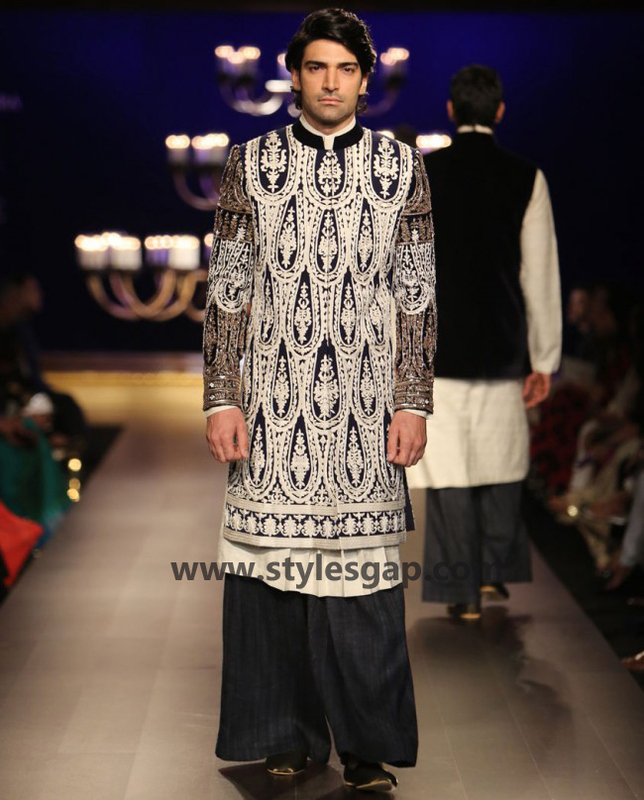 The lengths are not kept traditional but are transformed in knee length style of Sherwani. 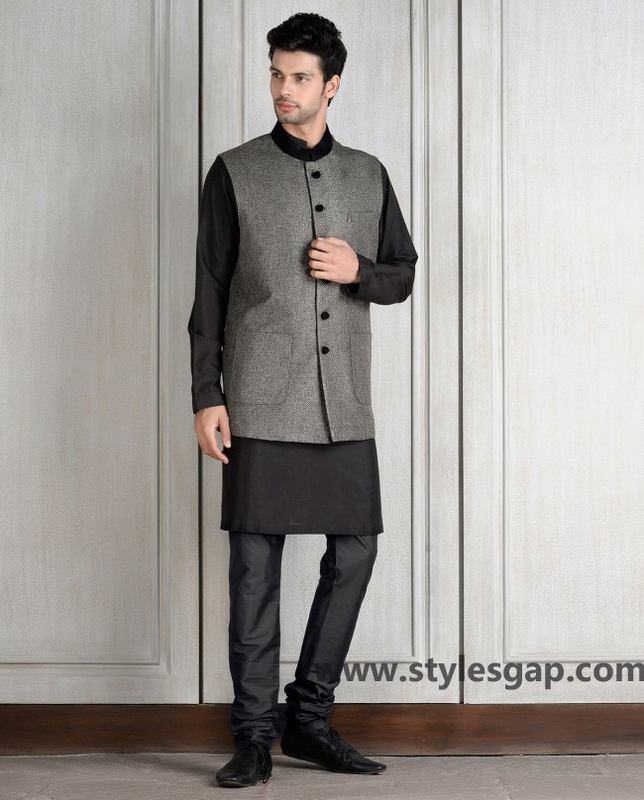 It is comparatively easier to carry and looks equally trendy. 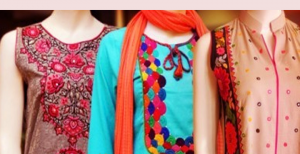 The hues selected from the palette are quite compelling and the eye was captivating. 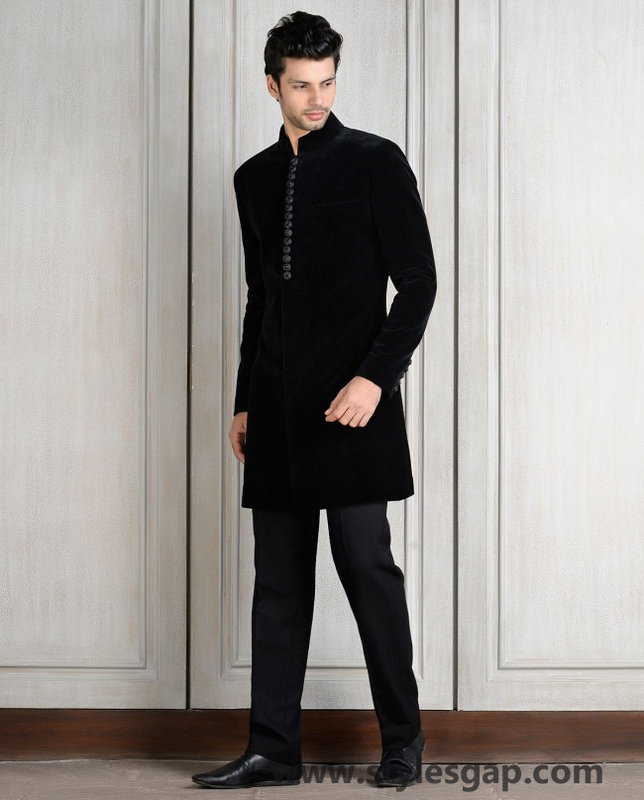 It aggravates the charms of your personality. 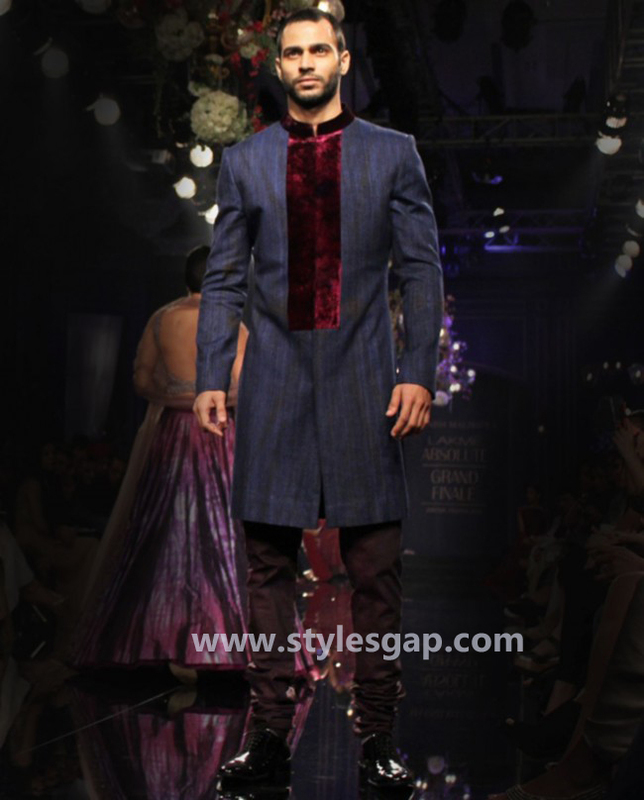 Maroon, navy blue, off white, graphite black, Burgundy, charcoal black, dark brown and beige are some colors which took the spotlight from his collection. 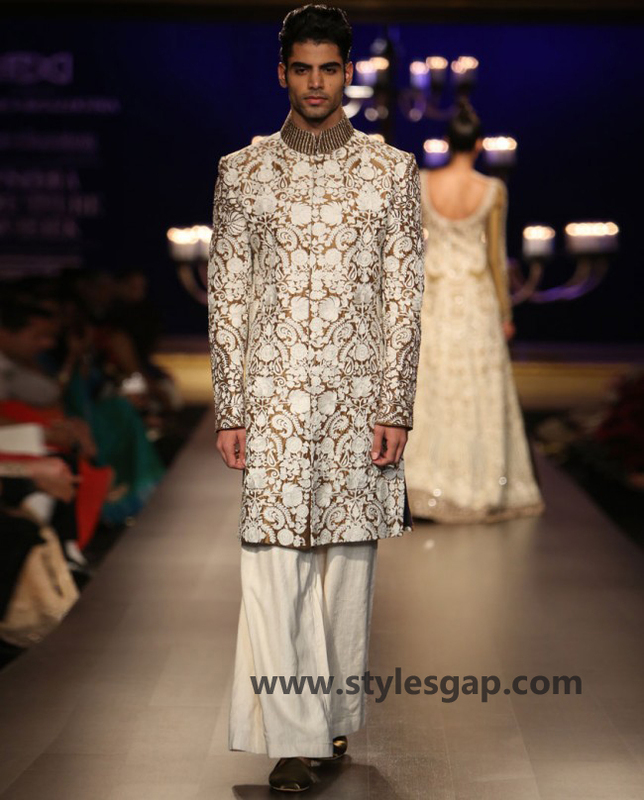 The style varies from architectural jaal work to Nehru style sherwanis. 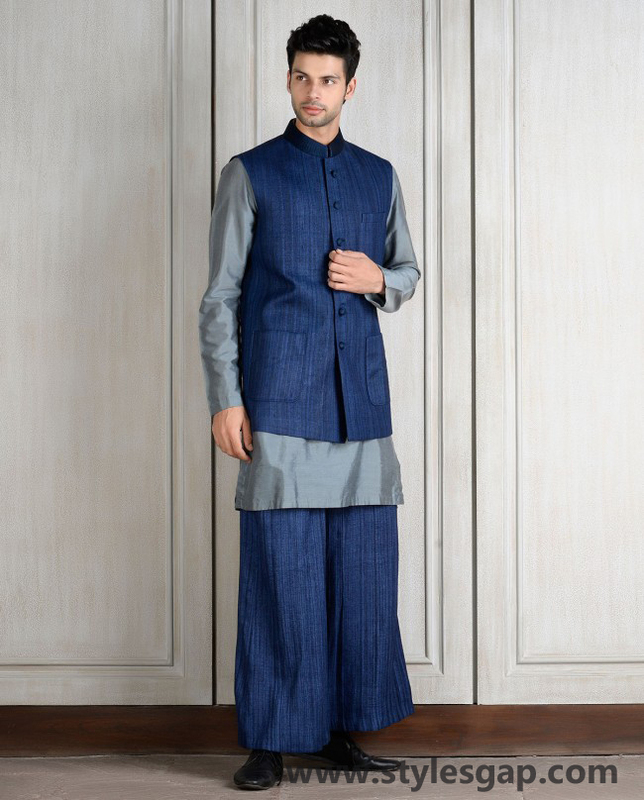 The collection is the perfect blend of old and the modern. 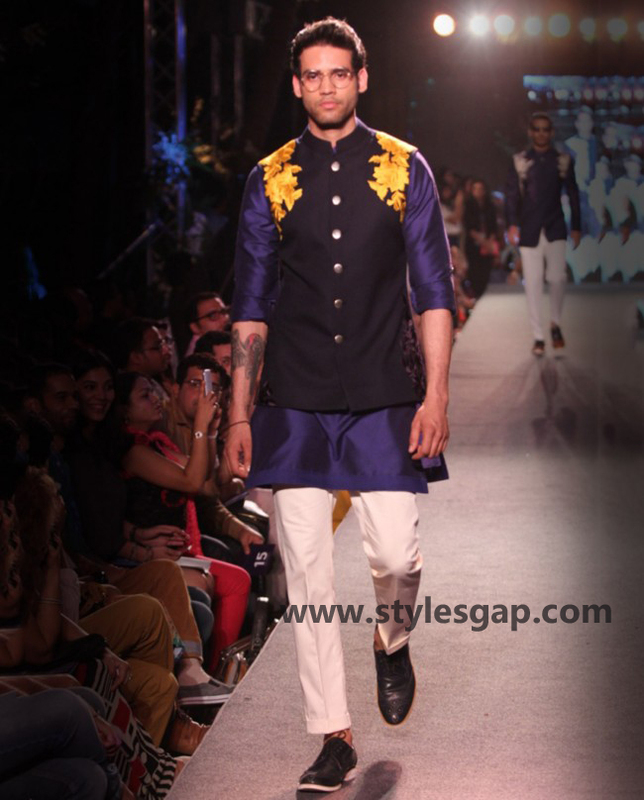 Embellishments start from the collar mirror work to thread work covering the entire front of the fabric. 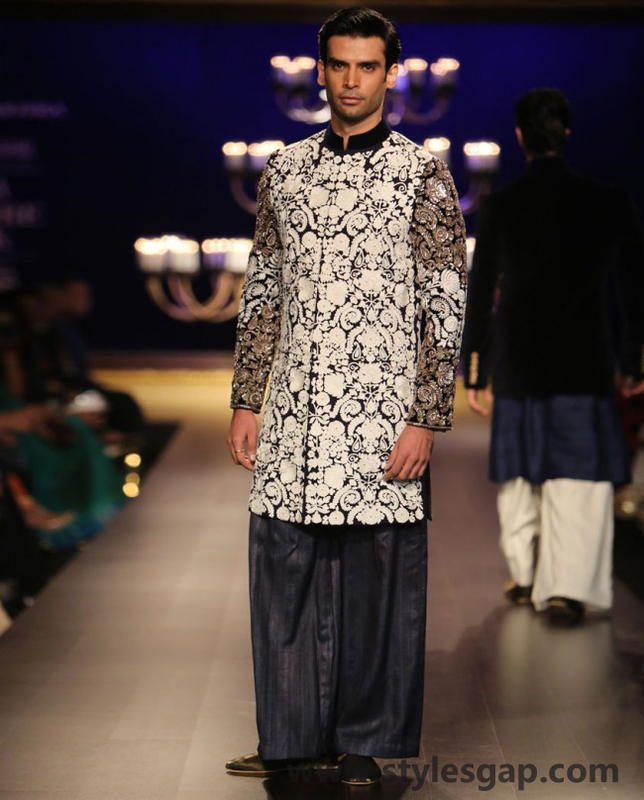 Sherwanis are available from velvet to Resham and a wide range of other fabrics. 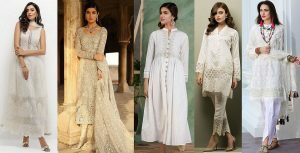 Besides, from architectural work sherwanis, there are embroidered motifs sherwanis which have gained much popularity because of the sheer simplicity they carry. 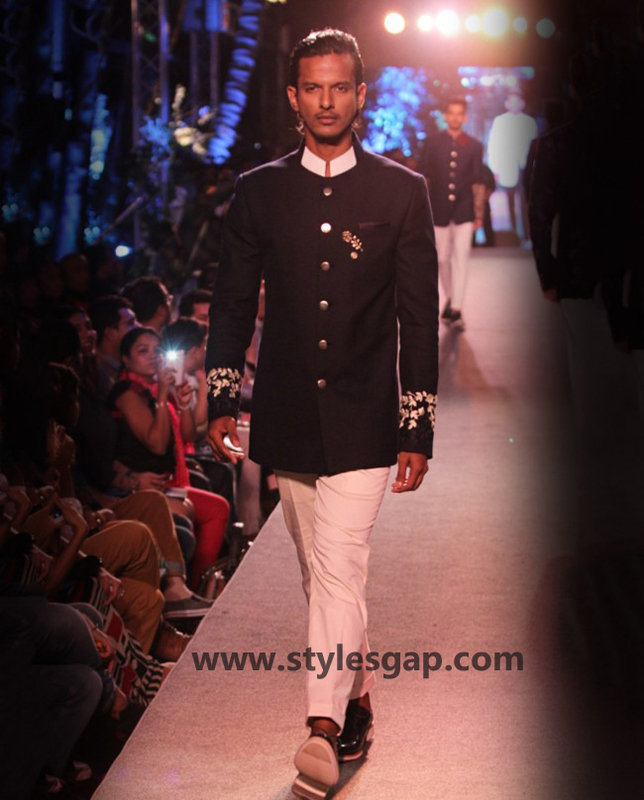 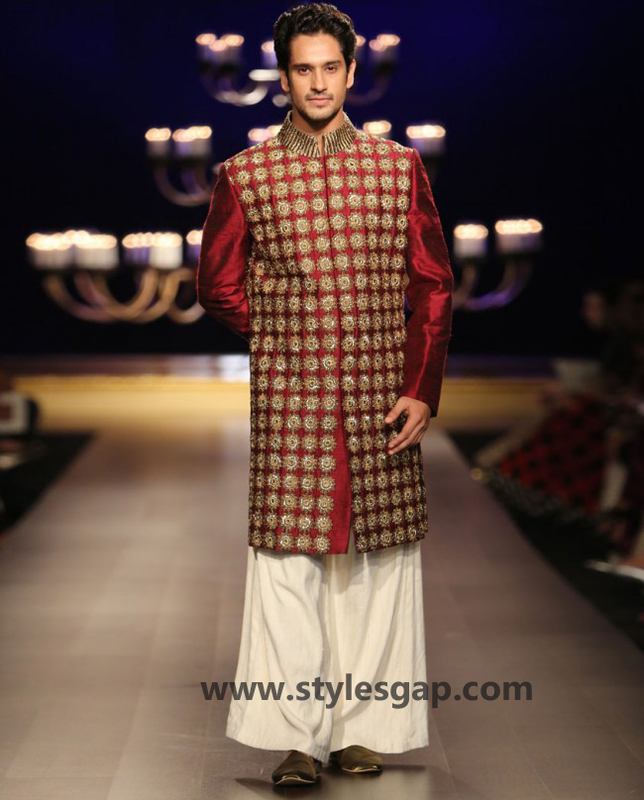 These sherwanis work best if you were looking for a perfect substitute for formal wedding suits. 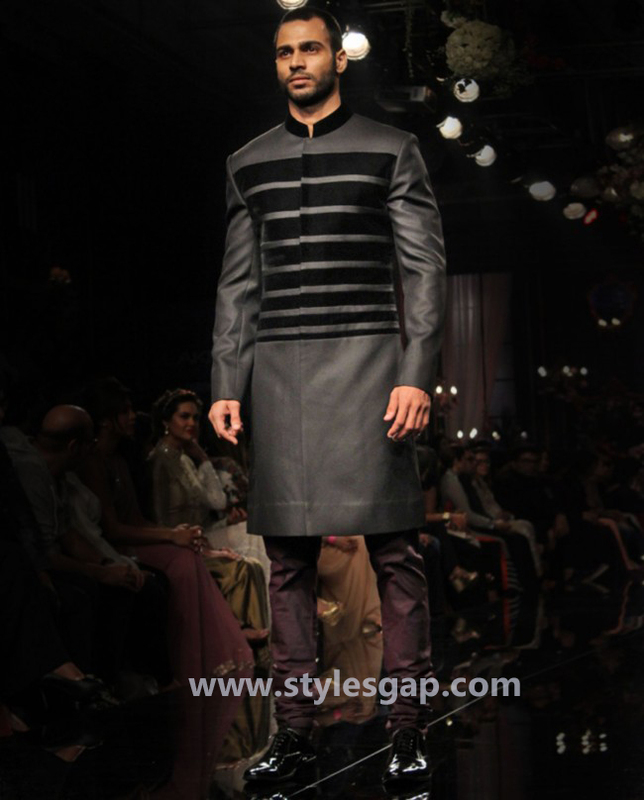 Prices happen to be the bit above the line but worth its fine quality and out of the box fascinating designs. 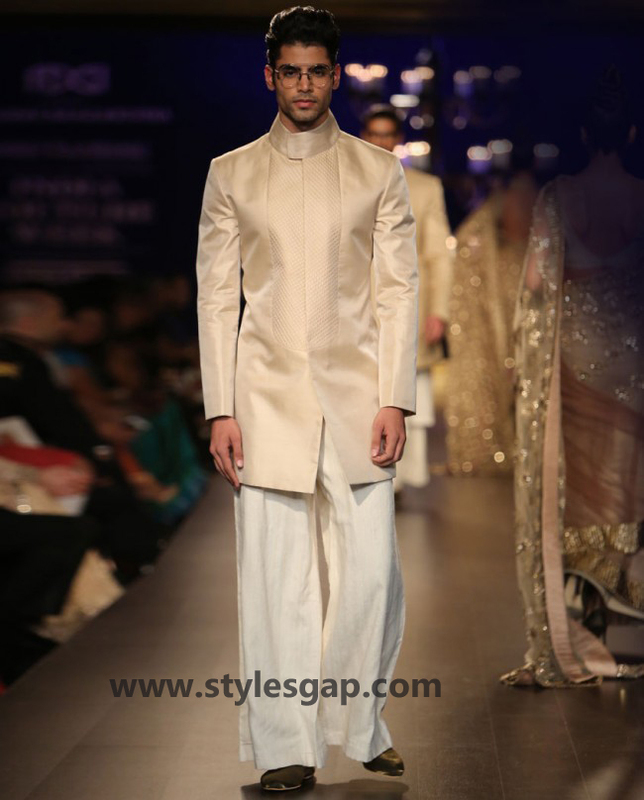 Sherwanis can’t be carried with any bottom as per your convenience, but the whole collection has either the fitted trousers or the loose ones in white or other contrasting colors. 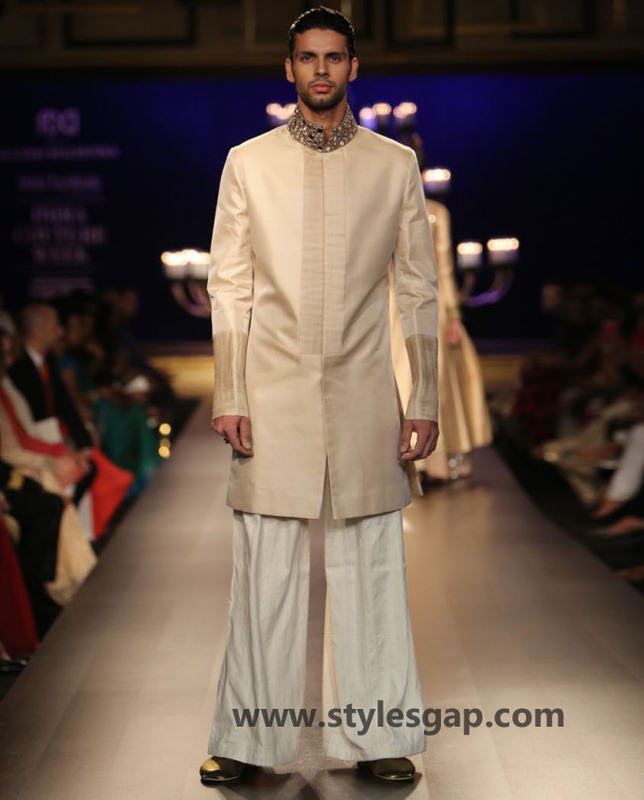 Keep scrolling hard as we are about to give you glimpses of the latest wedding Sherwani & Party Suits Collection 2016-17 by none other than Manish Malhotra, the style icon of the Indian fashion industry.